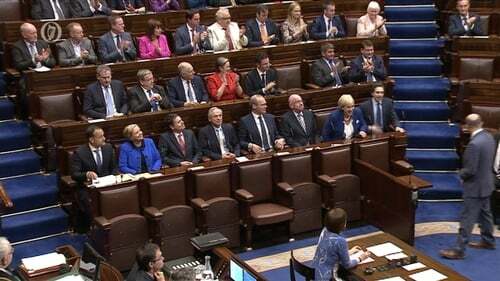 Taoiseach Leo Varadkar has announced his Cabinet in the Dáil, with a number of TDs moving to new briefs. Frances Fitzgerald will continue in her role as Tánaiste, but moves from the Department of Justice to the Department of Enterprise and Innovation. Simon Coveney, who was Mr Varadkar's rival for the Fine Gael leadership following the retirement of Enda Kenny, also moves departments. The newly-named party Deputy Leader leaves the Housing ministry and becomes the Minister for Foreign Affairs with special responsibility for Brexit. Mr Varadkar said there were "enormous challenges" with regard to foreign policy, including helping to restore power-sharing in Northern Ireland. In one of the most significant changes, the ministries of Finance and Public Expenditure and Reform are to be re-united. Paschal Donohoe, one of the most prominent supporters of Mr Varadkar, is to take up the ministerial role there. He had previously been Minister for Public Expenditure and Reform. Outgoing Minister for Finance Michael Noonan announced last month that he did not want to be considered for a role in the new Cabinet. In the Dáil, Mr Varadkar said there was "now a real logic to joining the two Departments following the recovery." As a result of Mr Coveney moving to Foreign Affairs, Charlie Flanagan has moved to become Minister for Justice in place of Ms Fitzgerald. The Taoiseach said his key task would be to continue to reduce crime and drive culture change within An Garda Síochána. Eoghan Murphy, who had served as Minister of State at the Department of Finance, takes up the Minister for Housing role vacated due to Mr Coveney's move to Foreign Affairs. Mr Varadkar said that the Dublin Bay South TD would consider further measures to tackle the housing crisis. Mr Varadkar had served as Minister for Social Protection under previous taoiseach Enda Kenny, but will now be replaced there by Regina Doherty. The Meath East TD will also assume the Employment brief, which is being separated from the Enterprise brief. Simon Harris, the youngest member of Cabinet and a prominent supporter of Mr Coveney during the leadership contest, retains his position as Minister for Health. Mr Varadkar said in the Dáil that he will also be responsible for bringing forward "legislation to allow for a referendum on the Eighth Amendment in 2018". Cork's Michael Creed also remains in his role as Minister for Agriculture, Food and the Marine. Richard Bruton is another who remains in his current position, with the Dublin Bay North TD continuing as Minister for Education. Mayo will continue to be represented at Cabinet following Mr Kenny's resignation as his constituency colleague Michael Ring has been appointed as Minister for Rural and Community Affairs. Rural and Community Affairs had been under the brief of Heather Humphreys, but she will now serve as Minister for Culture. Dublin Rathdown TD Shane Ross continues in his role as Minister for Transport, Tourism and Sport. His fellow Independent Katherine Zappone also remains as Minister for Children. Another member of the Independent Alliance, Denis Naughten, remains in his role as Minister for Communications and Climate Action. Mary Mitchell O'Connor is no longer a minister, having been removed from her role as Minister for Jobs, Enterprise and Employment. She will now serve as a Super Junior Minister with responsibility for Higher Education. Ms Mitchell O'Connor will continue to sit at Cabinet in that capacity, but will no longer have a vote at Cabinet. Donegal TD Joe McHugh, who had served as Minister of State for the Diaspora, becomes the party's Chief Whip and Minister of State with responsibility for the An Gaeilge, Gaeltacht and the Islands. He replaces Regina Doherty as Chief Whip. Wexford TD Paul Kehoe remains in his role as Minister of State in Defence, while Independent TD Finian McGrath remaining Minister of State with responsibility for Disabilities. Earlier this afternoon it was announced that Seamus Woulfe will replace Maíre Whelan as Attorney General following her appointment to the Court of Appeal.